The Gough Island Moorhen was formerly a subspecies of the Tristan Moorhen (G. nesiotis), extinct by the end of the 19th century. This extinction was the result of hunting, predation by introduced rats and cats, and habitat loss by fire. 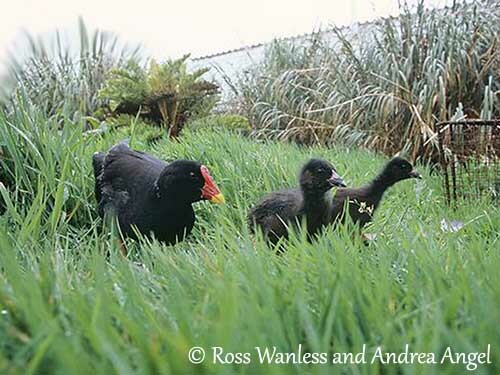 The Gough Island Moorhen was introduced to Tristan da Cunha in 1956, but none of these releases has been documented, and the release which occurred at Pigbite has never been published. The moorhens were found on Tristan only in 1973. Later reports state that six pairs were released. Several releases have been done between 1950 and 1960. The Gough Island Moorhen pose a management problem because it takes the eggs of the Atlantic Yellow-nosed Albatross (Thalassarche chlororhynchos) that breeds on Tristan da Cunha. On the other hand, the Gough Island Moorhen is a predator of the introduced House Mouse (Mus musculus) and it also scavenges from carcasses, both are significant conservation concern. As the project to eradicate the mice is waiting for approval, we can suggest that the poisoned baits used for the mice will be probably toxic to the moorhens and will become an additional threat for this yet threatened species. In this case, the introduced moorhen population of Tristan da Cunha could be used to re-stock Gough if necessary. The adult is smaller than Gallinula chloropus, and both have superficial resemblance. The Gough Island Moorhen is a strongly built Rallidae with short wings. Head, neck and underparts are black, without white (or reduced) white on flanks. The upperparts, including wings and tail, are brown. The tail shows white lateral undertail-coverts. The bill is yellow-tipped, whereas the bright red base extends up to the forecrown, forming a shiny red shield between the eyes. The eyes are red. Legs and feet are red-orange with heavy greenish-yellow blotches. The juvenile is mainly brown with paler belly and buffy-white undertail-coverts. The bill and the reduced shield are dull greenish-brown with paler tip. The eyes are dark brown. Legs and feet are greenish. The immature is greyish-brown overall with darker head. The upperparts are chestnut-brown whereas the belly is mostly sooty grey with pale-tipped feathers. The bill is dull, dark red with yellow-green tip and shiny red shield. The Gough Island Moorhen occurs on Gough Island, and has been introduced to Tristan da Cunha, in South Atlantic Ocean. The Gough Island Moorhen usually frequents very dense tussock grass vegetation, and can also occur in bushes in tree-fern areas. It is usually found below 500 metres of elevation, including in marshy areas and along streams in coastal zones. The birds introduced to Tristan da Cunha occur in dense, inaccessible fern-bush (Blechnum) with dense Phylica arborea trees, between 300 and 900 metres of elevation. 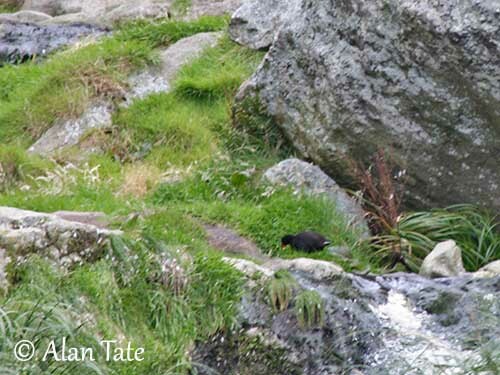 The Gough Island Moorhen’s common call is a loud, high-pitched “koo-ik” usually often repeated. We can also hear screaming series of “koo-ik” notes. Both mates utter repeated low-pitched, monotonous “ik” or “ook” only audible at close range. Near the nest, the female utters harsh, repeated calls. This species is more easily heard than seen. 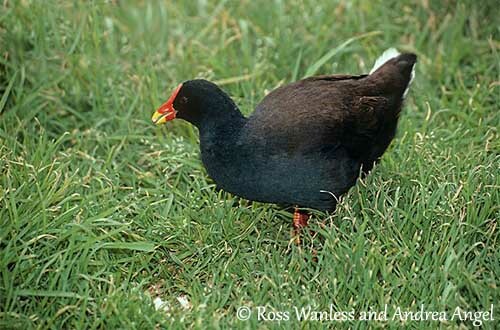 The Gough Island Moorhen stays under the vegetal cover and rarely ventures into open areas. This species feeds primarily on plant matter, seeds, carrion and invertebrates. It feeds on grass and grass-heads in scythe-motion. It also scavenges from petrel and prion carcasses, often partially eaten first by the Brown Skua. It may take garbage too. While searching for food, it enters petrel’s nesting burrows and scavenges around active nests of albatrosses. However, and from islander’s observations, the attack of eggs could follow desertion by adults. Such predation had not been actually checked, and cannot easily be interpreted in a different way. The possibility that moorhens prey on eggs only from time to time may not be excluded. They primarily visit nests for scavenging and albatrosses are known for showing no form of defence against intruders, apart some bill snapping. The predatory behaviour of the moorhen could be a recent development, and usually, they forage close to both active and abandoned nests and burrows, mainly searching for invertebrates. The Gough Island Moorhens are monogamous and both mates defend the territory. The pair-bonds may last only one season, but sometimes for several following years. They are solitary breeders. Pair-forming and courtship behaviour are unknown, but usually, the sexual displays are reduced and simple in the family Rallidae. We can suggest that courtship feeding and mutual preening occur regularly, and courtship chases often lead to copulation. The white undertail-coverts are exposed during courtship and aggressive displays, while the moorhen raises its tail. The Gough Island Moorhen is probably resident within its restricted range. This short-winged species is almost flightless. However, it climbs easily and is able to fly over obstacles. The breeding season occurs between September and March on Gough island, and probably between December and March on Tristan. Both sexes build a typical Rallidae nest, a circular and cup-shaped structure with an access to the entrance, tunnel or track. It is made with sticks and plant materials collected around the nest-site. It is placed and concealed in tussock grass, often Poa flabellata. From an observation in captivity, the female lays 2-5 eggs, and both adults incubate during three weeks. At hatching, the chicks are covered with black down. The bill is crimson at base and greyish at tip, with a white spot at top of the upper mandible. Legs and feet are black. Both parents feed them, sometimes with fresh flesh from bird carcasses. This species can produce two broods per season, and the young of the first clutch usually act as helpers in the second brood, and assist the adults in feeding the chicks. The Gough Island Moorhen has restricted range on two small islands. The species is still threatened by introduced rats and other predators, especially on Gough Island, and this problem remains the major threat for these birds. The total population was estimated at 8,500 mature individuals, equating to 4,250 pairs on Gough in 1983. This is roughly equivalent to 13,000 individuals. In addition, there were 250 pairs on Tristan da Cunha in 1984, and this population was suggested to be increasing. 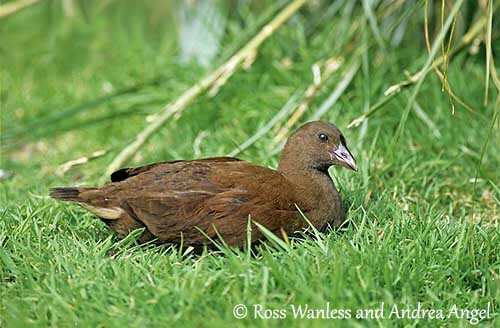 But currently, the Gough Island Moorhen is listed as Vulnerable.